A band of child pilgrims in mass exodus, 100,000 strong, spanning seven decades (1869-1939), arrived in Canada. Like seed, they were scattered from Atlantic to Pacific, not in handfuls as might have been appropriate for children, but in singles, one here, another there. Ranging from infants to teenagers, sprouts with feeble roots, transplanted into dry and sometimes unwelcoming soil. Hampered by the derogatory label, Home Child, severed from their familial connections in the ‘Old Country,’ they grasped the small opportunities offered them. Like cedars that grow out of rock, they persevered. Against the odds, they took root, became grounded and sturdy enough to change the landscape of our young Dominion. These solitary shoots multiplied until today their offspring make up ten percent of Canada’s population. 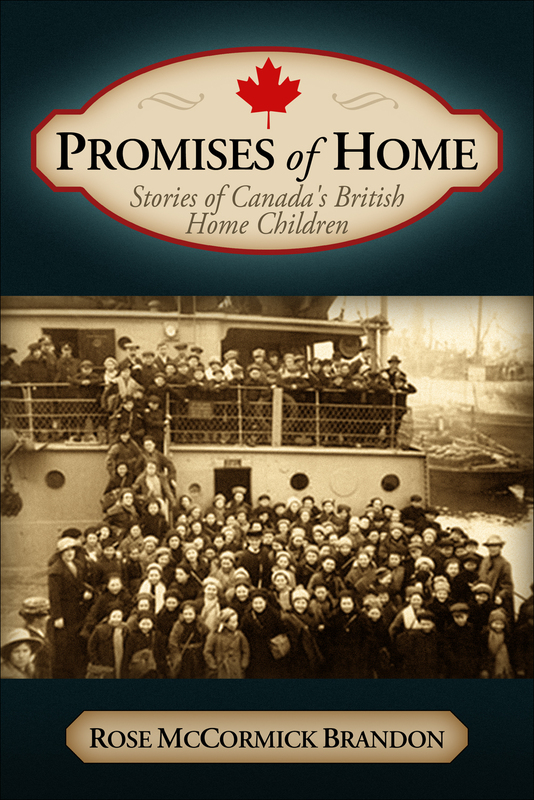 Promises of Home is a collection of their stories. Rose McCormick Brandon’s grandmother, Grace Griffin Galbraith, was one of those solitary shoots. She’s published articles, personal experience pieces and stories of British Home Children in Canadian, U.S. and Australian periodicals. She and husband, Doug, live in Caledonia, Ontario.